← Did Astaxanthin Protect Me From A Bad Sunburn? 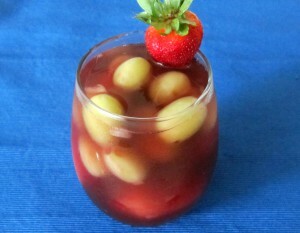 Frozen grapes in cherry drink garnished with a strawberry. So refreshing! At the beginning of the year, I started taking 4 tablespoons of collagen powder everyday to help heal leaky gut. It has also improved my tendon and muscle elasticity, according to my chiropractor. He says I’m easier to adjust and I hold the adjustments longer since I started taking the collagen. At first, it was simple to add the collagen powder to filtered water, a little lemon juice, and stevia then down it. But as the weather got warmer, that just didn’t appeal anymore. So I got creative! I put the water, juice, sweetener, and collagen powder in a large canning jar with a blender ball (from a blender bottle) and shake until the powder dissolves. Pour over the “ice cubes” of your choice and you’ve got a light refreshing drink to beat the summer heat! There you have it. It’s basically jazzed up organic koolaid—great for adults and kids (without the alcohol, of course). For a flavor boost, I decided to make ginger ice cubes by steeping ginger slices in boiling water. I also think there are possibilities for cinnamon, star anise, and maybe even clove ice cubes! For the frozen lemonade, I had to freeze lemon juice with honey in ice cube trays. Once frozen, I was able to blend them in a high powered blender and slowly add the water (with the collagen powder already mixed in it). The collagen made it a little frothy as you can see from the slideshow. Note: Stevia won’t work here as the cube will freeze up hard like regular ice cubes and not slushy. What’s my favorite flavor combo? Cherry with grapefruit ice cubes. When posting the slideshow I realized I didn’t have a shot of it. I must like it so much that I never stopped to take a picture! 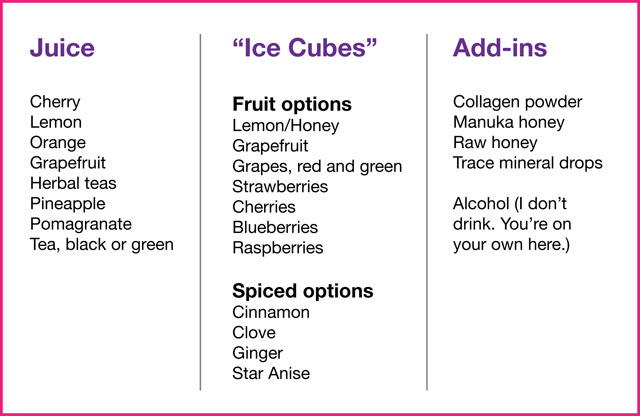 Here’s a little mix and match chart to fuel your imagination in creating your own summer drinks. Enjoy! This recipe was shared with Live It Up, Mix It Up, Block Party, Sweet Sharing, Much Ado, Clever Chicks, Round Tuit, Motivation Monday, Read Food Recipe, See Ya in Gumbo, Inspiration Monday, Happiness is Homemade, Sweet & Savory, Simple Life, Saturday Sparks, Savoring Saturdays, Flaunt It, Dare to Share, Serenity Saturday, Crafty Showcase, Saturday Showlicious, Simple Saturday, Weekend No Rules, Recipe of the Week, Anything Goes, Frugal Friday, Fancy This, Friday Favorites, Inspiration Spotlight, Welcome to the Weekend, Real Food Friday, Old Fashioned Friday, Natural Family, Unprocessed Friday, Simple Meals, Foodie Friday-2, Fight Back Friday, Friday Five, Foodtastic Friday, Healthy Vegan, 5 Friday Finds, Friday Foodie, Craft Frenzy, Kitchen Crafty, BFF Open House, Inspired Weekends, Foodie Friends, Foodie Friday-1, Weekend Retreat, The Yuck Stops Here, Try A New Recipe, Delicious Dish, Gluten-free Friday, Handmade Hangout, Homeacre Hop, Feathered Nest, Tutorial Thursday, Inspire Us Thursday, Simple Lives, Let’s Get Real, Pennywise Platter, Tutorial Tuesday, Wildly Original, Fabulously Frugal, It’s A Party, Real Food, Wicked Awesome, Fresh Foods, Look What I Made, Creative Exchange, Southern Special, No Rules Weekend, Wildcrafting Wednesday, Mountain Woman Rendezvous, Wellness Wednesday, Doggone Dirty Craftin’, Healthy Tuesday, Hearth & Soul, Allergy Free, Meet Up Monday and Full Plate. 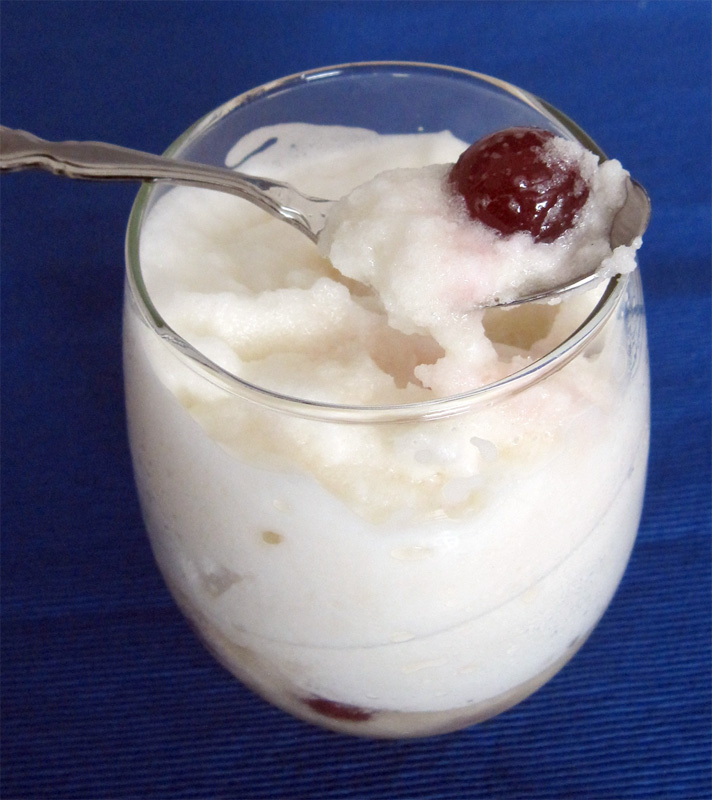 This entry was posted in Beverages, Recipes and tagged beverage, corn free, dairy free, egg free, frozen, fruit, gluten free, lemon, refined sugar free, vegan. Bookmark the permalink. Oh, man, I love my slushie drinks in the summer. Going to have to try this one before it ends! Great collection of summer drinks! Thanks so much for sharing your awesome recipe with Full Plate Thursday and have a great weekend. Sangria is a new found love for me. But grapefruit ice cubes? Genius & sounds delicious! Thanks for sharing at DDT! Yum! All of these drinks sound so refreshing and tasty! Thank you! I would love one on all these hot and sticky days! I would love if you would drop by and link your post up to my new blog party, Celebrate It! It’s all about how we celebrate our everyday life! Hope to see you there! Delicious drinks, thanks for sharing with Hearth and Soul blog hop pinning. I am so happy to drop by adn let you know that I have chosen this delicious link as one of my favorites this week on The Yuck Stops Here recipe link party! I think this sounds delicious, and I’m sure to be trying at least one of these drinks. I hope you’ll come pick up your “I’ve Been Featured” button tomorrow evening so that you can proudly display it! CONGRATULATIONS & HUGS! oh, gosh, these look amazing! I can’t wait try different combos. Thanks so much for sharing with us at Simple Lives Thursday; hope to see you again this week. Ooh that looks good! Great idea to use frozen grapes as ice-cubes too! Mmmm such refreshing drink options for the heat I’ve been experiencing! Thanks so much for sharing this at Healthy Vegan Fridays – I have pinned your recipe to our Pinterest Board. Oh wow! never thought about preparing my own sangria! And i must admit i do love it! Thank you for linking up with #fridayfoodie linky! Ginger ice cubes…love it! And frozen grape ice cubes, well why haven’t I thought of that? The mix and match chart is great. Every time I come up with some pairings, I find another and another. Thank you for sharing, Jillian. And thank you for the Liebster award. I hope to answer the questions this week (I haven’t been blogging much lately). Yum! Great idea! Thank you bunches for linking up and partying with us this week! Love all the drink combinations, perfect for summer. Thanks for linking up to Sweet and Savoury Sunday, stop by and link up again. Have a great day!! Wow! You really hit the jackpot with this post! Everybody loves to explore tasty summer drink recipes! I especially love your helpful mix and match chart. I also love the idea of using ginger ice cubes!I am sharing and pinning this wonderful post! 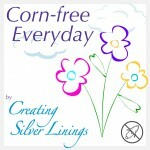 I am so delighted that you shared this with us at the Healthy, Happy, Green and Natural Party Blog Hop! I appreciate it!